Just wanted to let you know about a new tree resource. With the help of Cyndy Ash Kanner, and reviews from Joe O’Brien of the USDA Forest Service and Jim Walla of NDSU, we now have a new publication on diseases of spruce trees including photos, id info, biology and management. The spruce diagnostic tool will be coming soon and will link directly to this pub for management info. Click here to read Diseases of Spruce Trees in Minnesota. If you requested a paper copy, watch for it in the mail soon. 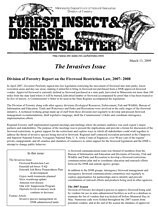 We hope you enjoy this issue of the Forest Insect & Disease newsletter. Foliage diseases my cause conifer needles to turn yellow or brown or drop prematurely. Hardwood leaves may develop yellow, brown, or black spots. These diseases weaken trees by reducing the ability of leaves to produce plant food. A review of categories of insects affecting tree and forest health: Defoliators, borers, sap-sucking insects, root-feeding insects, cone- and seed-destroying insects, and non-native invaders. Forest health is affected by insect outbreaks, diseases, invasive species, regeneration, fire ecology, natural disturbance, and many other factors. Not all insects and diseases are bad. Native insects and diseases are a normal part of a healthy forest. An example is the periodic defoliation events from forest tent caterpillars (armyworms). Minnesota forests evolved in the presence of these bugs, and they recover quickly from outbreaks. On the other hand, non-native, introduced insects, diseases, and plant species pose a serious threat. Invasives must be addressed quickly. Diseases like Dutch elm disease, shrub species like buckthorn, and new invasive insects like Gypsy moth and emerald ash borer can cause serious forest health problems. It’s critical that landowners learn to identify these species quickly and keep their woodlands healthy and free from invaders to the greatest degree possible. The pages in this section are designed to provide basic information about forest health issues in Minnesota. Probably the best source of forest health information in Minnesota is the Forest Insect & Disease Newsletter, published by the MN DNR Division of Forestry. As more and more invasives enter our woods, forest health can seem daunting at times. But it’s important that we all maintain vigorous, healthy native woodlands to the greatest degree we can. Most forest health threats are far easier to prevent than to eradicate once they’re established. Good luck! Your neighbors, as well as future generations, will thank you for it. Some of the most common invasive species in Minnesota’s woods include buckthorn, garlic mustard, Dutch elm disease and the emerald ash borer. Others that might not come to mind could be earthworms or Gypsy moths. All of these species are non-native and are causing significant damage in Minnesota’s forests. You can find identification guides to common invasive species at the DNR invasive species index.